This trip was either going to be an epic adventure or a complete nightmare. 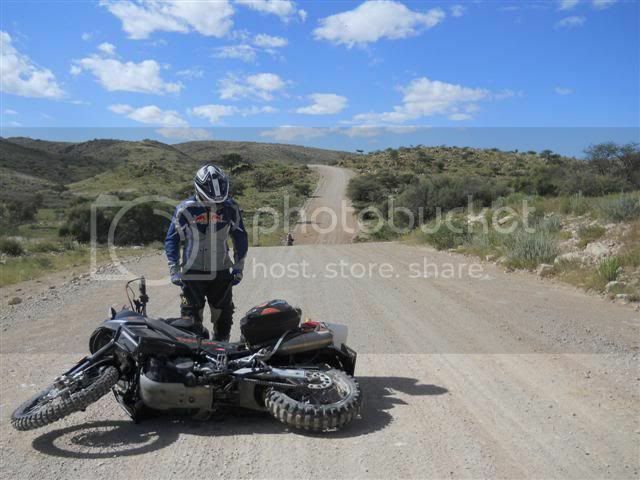 This was our first adventure bike trip and it was going to be a big one. A little history on how this all happened: My Dad used to ride a 2001 Dakar that my brother and I bought for him back in 2001 and last year he upgraded to the 800GS. 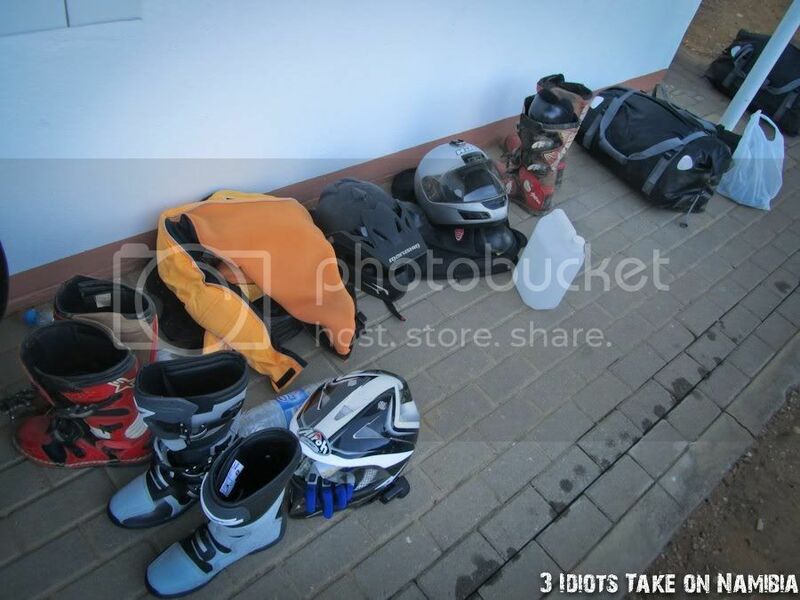 He then asked us if he should sell the Dakar or if we wanted to take the bike and "share" it? Wasn't difficult to decide and so I ended up with the Dakar in my garage. 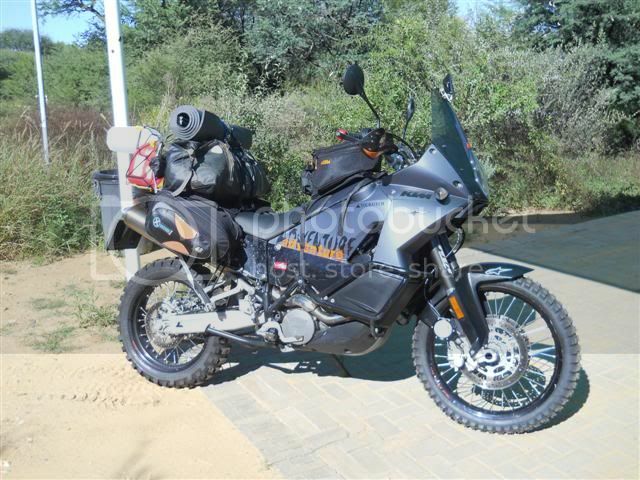 My brother and I also ride little plastic KTM's now and then and in September 2011 I mentioned to one of our riding buddies that it has always been a dream of mine to do an epic adventure bike trip in Africa. He then said that if we commit to a trip like this, then he will go with. But he doesn't have a DS bike. So off he went and bought a used KTM 990. 2 Riders sorted. Then my Dad said he is also on board. The thing is, he will be turning 64 on this trip and he has had two major operations AND a tripple heart bypass in the last 3 years. He has cheated death 3 times, and he's not that strong anymore. But to do a trip like this with my Dad - priceless. 3 Riders sorted. Then my brother also commits - but he doesn't have a DS bike either, 'cos I'm taking the Dakar. 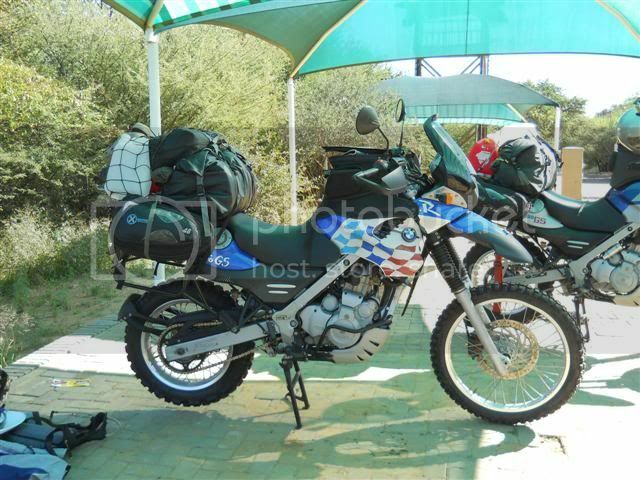 So, we found him a good looking Dakar on this forum, he borrowed money from my Dad, flew down to Cape Town with all his gear, bought it and rode it back to PTA. If there's a will, there's a way. 4 Riders sorted. In the end my Dad decided not to go due to skill and health reasons. This turned out to be a very, very wise decision. Now, when it comes to DS bike experience on long trips - none! Mechanical knowledge about fixing bikes - none! We had to learn as we go and make a plan if we need to. 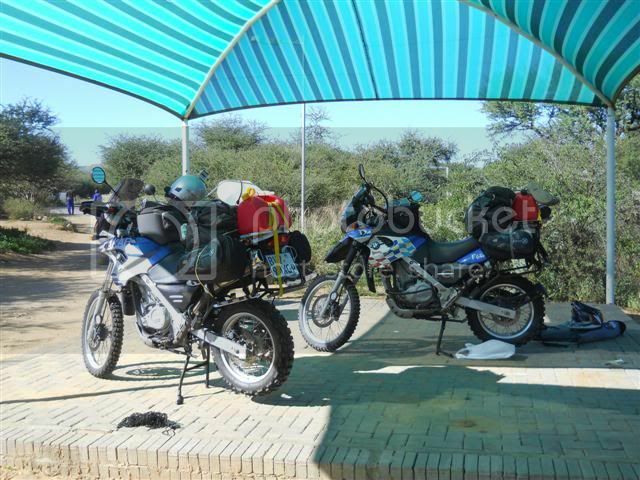 We decided to trailer the bikes to Windhoek, leave the car and trailer at a campsite, do the trip and trailer back. 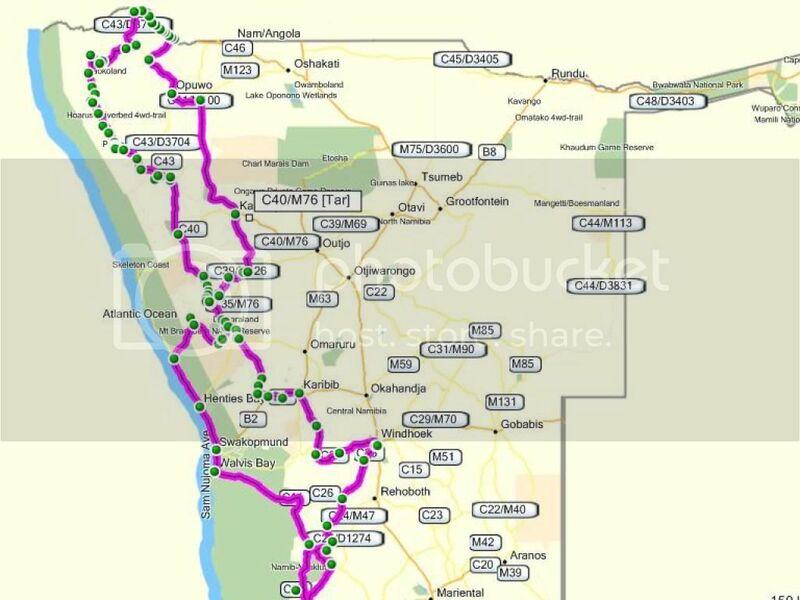 The main reason was that our tyres won't last if we rode the bikes to Nam and that we could get to Windhoek in one day in a car. This was our planned route. 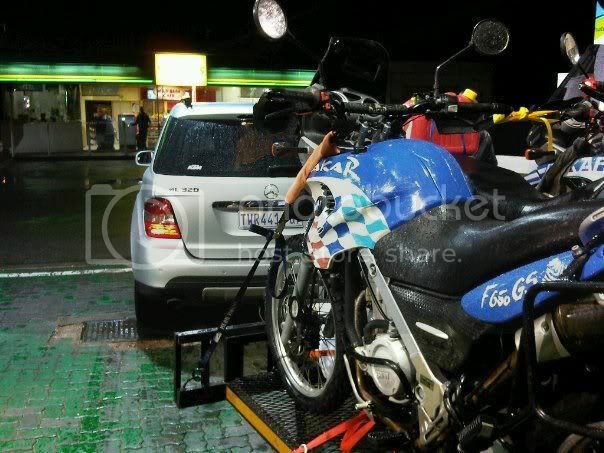 Sunday, 22 April 2012 @ 02:30 we hit the road! 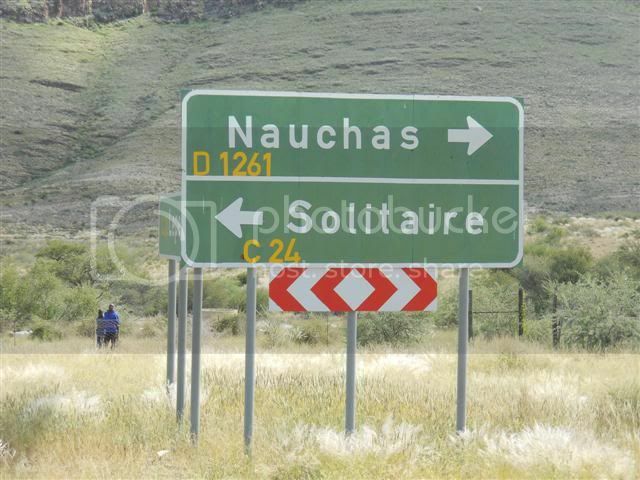 For those of you who know this road - it has to be the longest, most boring and torturing stretch of road in the word! 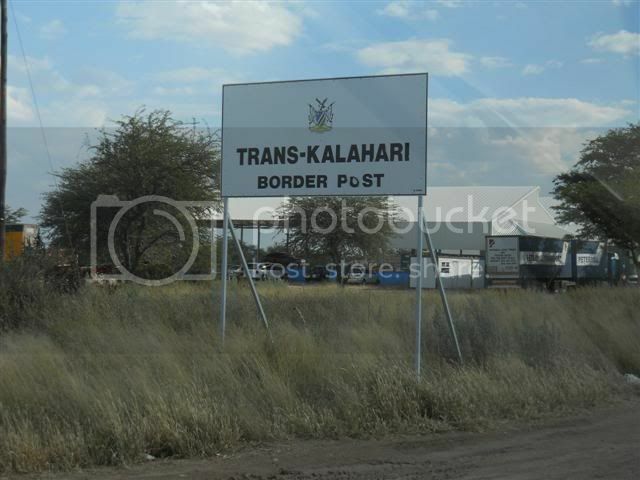 The Trans Kalahari Highway. 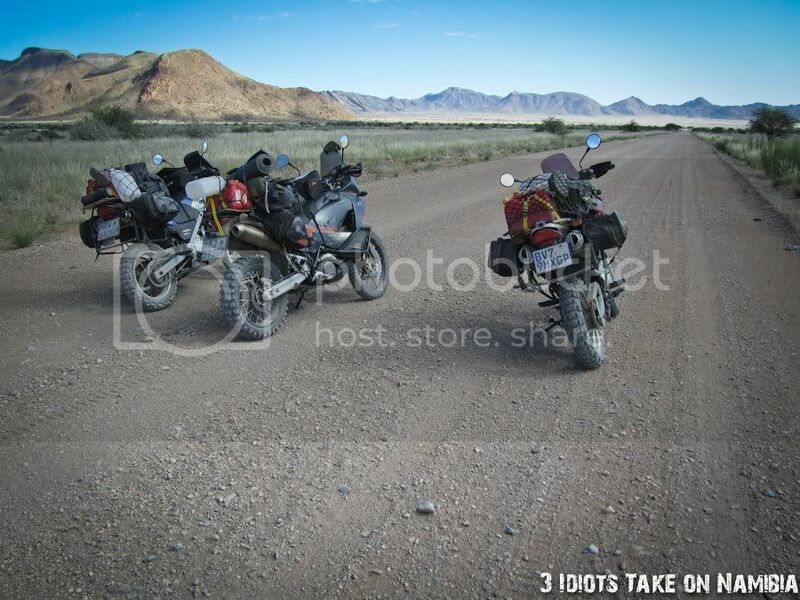 We finally made it to Namibia and these are the idiots. Me(Eswee), Gummi and my brother Liam. 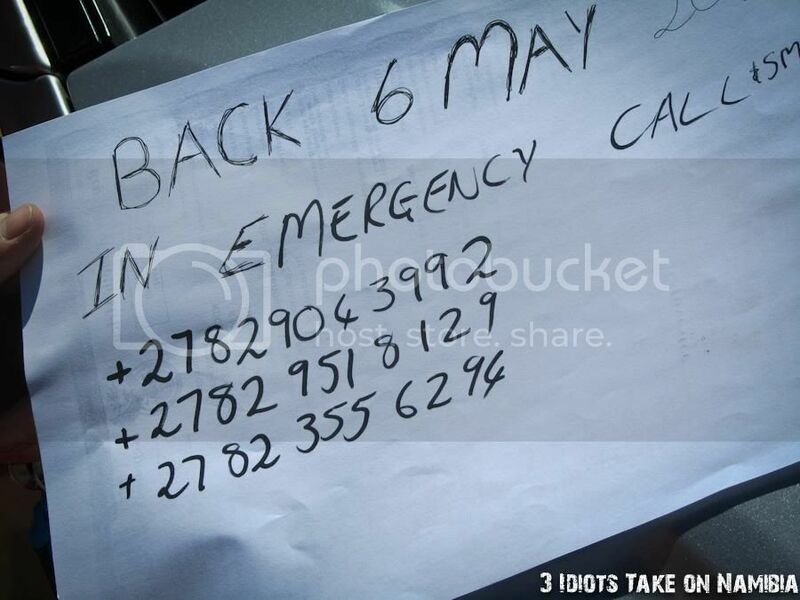 We leave a note on the car window. 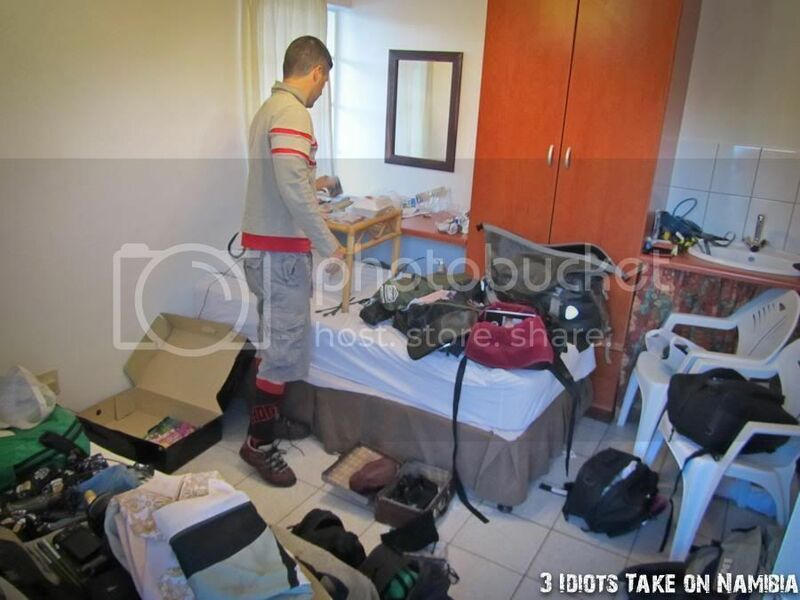 At around 12:00 we fuel up and head for Sesriem. 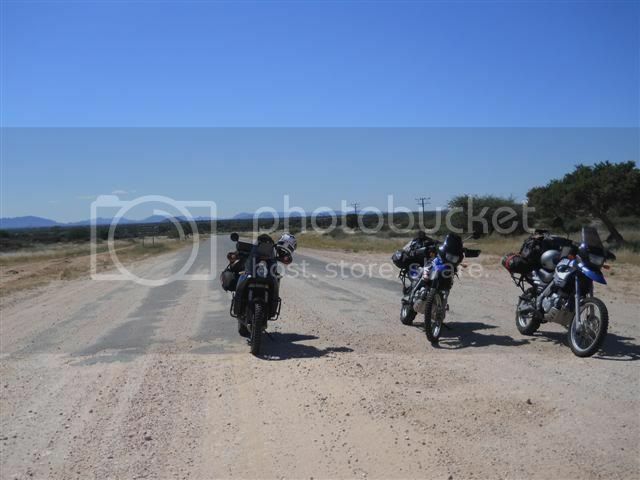 When the tar ends we stop, take a good look around and realise that we have 3000km of Nam gravel that lie ahead of us. The trip of a lifetime has actually started! 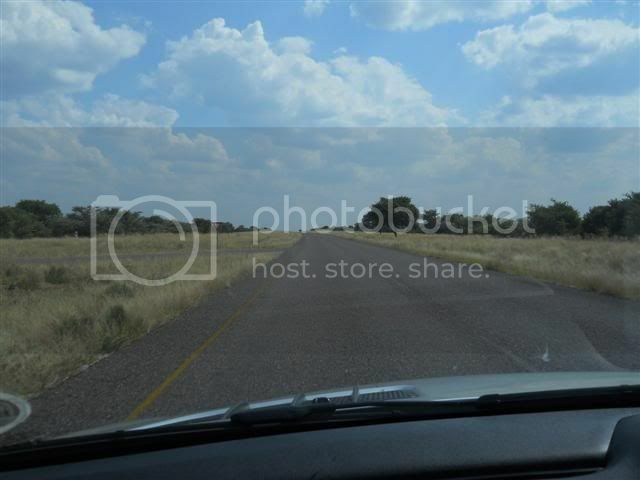 The road is good and and the scenery is amazing as we go over Remshoogte Pass and over a few streams. 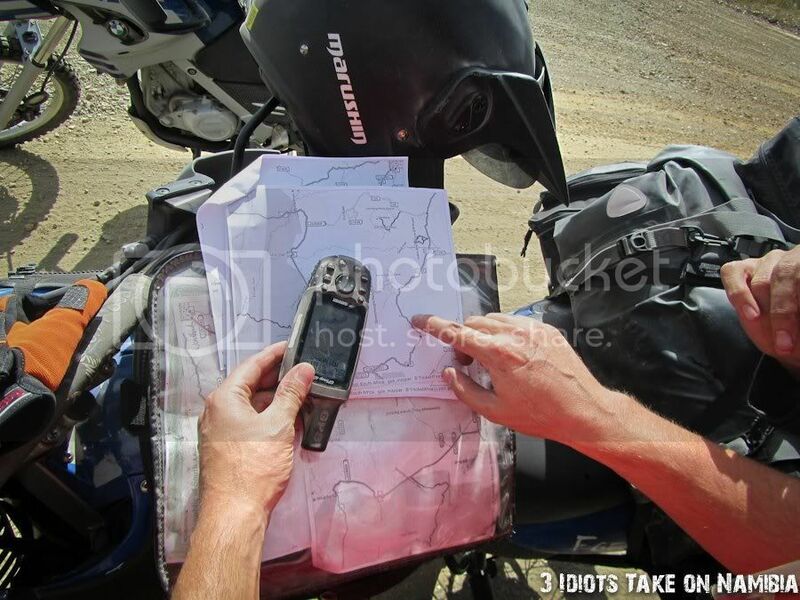 Trying to figure out the GPS and the maps. Before the day ends, just after crossing a stream we are all reminded that your smile can be wiped of your face very quickly. What happened that you dropped your bike? It reminds me very much of my experience in Nam last year. 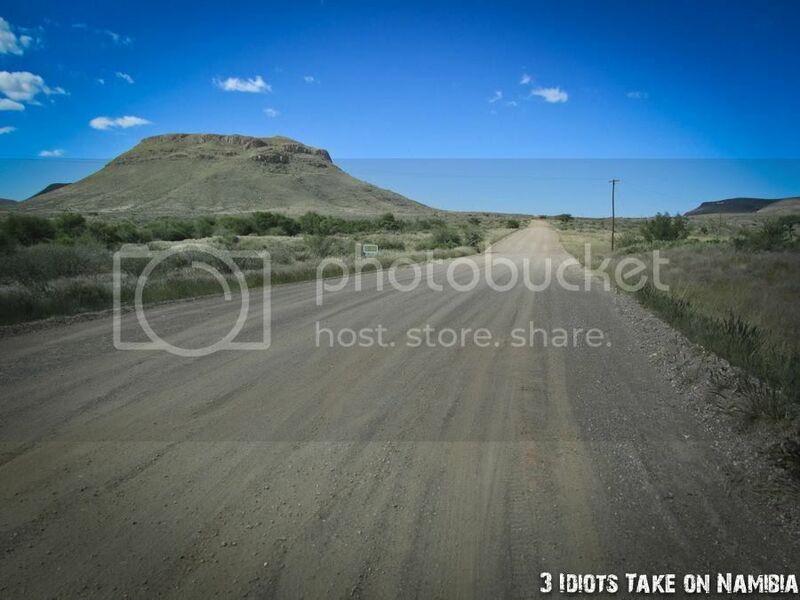 I have the theory that you have a 30% chance of coming off on the first day of riding a Namibian dirt road. 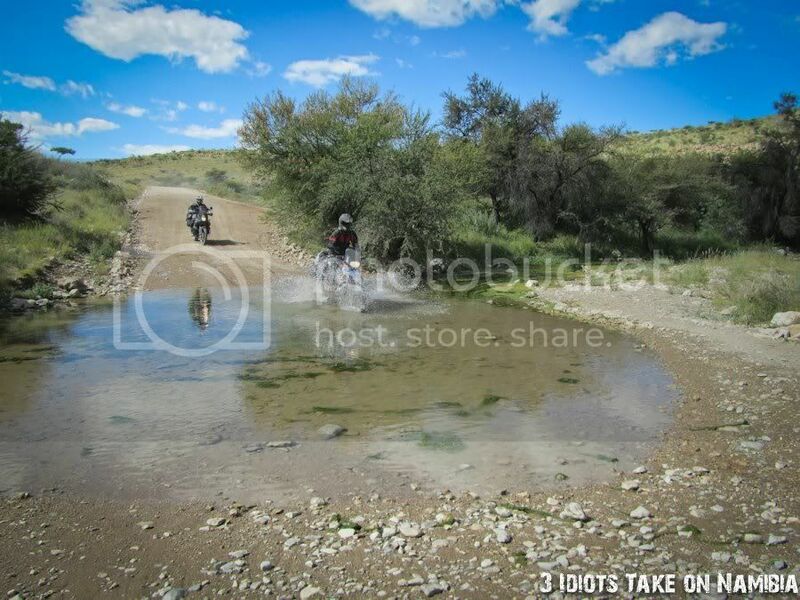 Riders came off because of 2 reasons: inexperience and underestimating Namibian dirt roads. This is going to be good......looking forward to the rest. 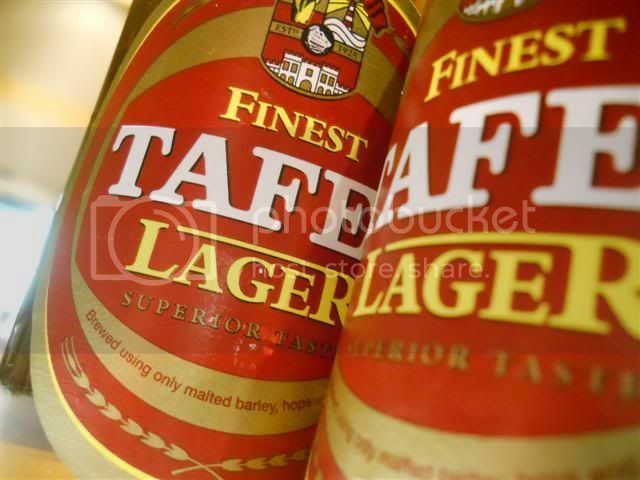 when the photo of those Tafel lagers opened up I knew this was going to be a good ride report. Where is the rest ? ?